We had three plans for our last full day in Aruba: (1) Spend time at the beach, (2) Eat at Pinchos, and (3) Visit the Red Light District. Our last visit to the beach was a ton of fun. For some reason a lot of fish kept following me around. Every now and then one would try to eat me like I was coral reef or something, but I was interesting. For dinner we went to Pinchos Grill & Bar. The restaurant is located on a pier and gives unobstructed views of the Caribbean. It seems that arriving at 5:30 p.m. for dinner in Aruba gets you the best seats in the house. The dinner was great and we watched pelican’s swoop into the water to catch fish as we ate. Once dinner was complete we headed to the Red Light District in San Nicolas. Before anyone’s mind starts to wander, every tour guide book recommends visiting Charlie’s Bar, which has been a staple of Aruba since the 1940s which is located right in the heart of the Red Light District. 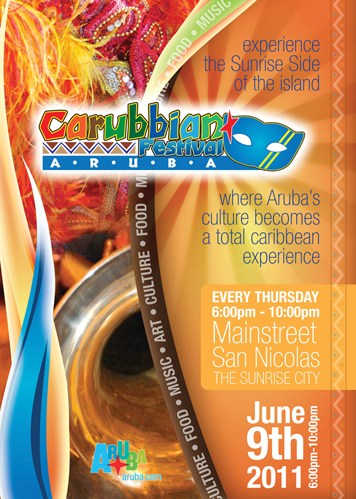 Also, every Thursday night is a Carubbian Festival with music and food and is a huge tourist attraction. We arrived at the festival around 8 p.m. and we walked around, listening to music and looking at the different people dressed for the festival. We didn’t try any of the food since we were full from dinner. Charlie’s Bar definitely lived up to the hype. The place was so fascinating to look at. Since the place has been in existence it has accumulated all kinds of items on its ceilings and walls, from license plates, souvenirs, money, photos, hats, shoes, clothing, all kinds of things. While in the bar we had Aruba’s Beer called a Balashi. It was pretty good on tap, but out of a bottle, not so much. After Charlie’s Bar we basically went bar hopping around the red light district. The festival itself ended right after Charlie’s Bar and then there were several more blocks which made up the red light district and almost none of the tourists were wandering down this way. It was a very fascinating experience. One of the bartenders in a random bar told us how it works. Each bar in the red light district houses 3-4 girls who have bedrooms somewhere attached to the bar. They all come from Columbia and are only allowed to stay for three months and then cannot return for a year. They get tested before they are allowed to come and every week they are in Aruba. We saw girls in the bars and also in the doorways to the some of the bars. Some of the girls were pretty attractive, other ones should probably seek a different line of work, lol, but all looked pretty much in their twenties and thirties. We watched in some of the bars how the guys would talk to the girls and it seemed like they had to buy them a drink, then they would pay the bartender some amount of money and disappear with the girl. The entire thing was extremely interesting…though many of the bars didn’t have many people in them except the girls and the guys looking for their services, so we sort of stuck out. We stayed until around 11 p.m. when the festival was pretty much wrapped up. It was the only place on the Island where we couldn’t get a taxi and ended up taking the bus back to La Cabana. hmmm sounds interesting. My honey and I are vising this comming October and we most def will taking a stro;;in the red light district. I met a real nice little Dominion girl named Anna who took me up to her apt for a very fun time!! 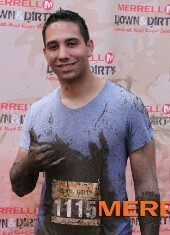 I'm going back as soon as I can.